Sometimes, small is good. Like our great little dog, who is a delight to have around. I never expected to have a dog EVER, but here I am with a dog that was rescued from the street. She may be small, but she’s still awesome in my book. But not all things should be small. In last week’s Share Your World, there was a question a gift I’d like. As I will explain in this post, I decided I needed to revisit that question before going on to this week’s questions. I was surprised to realize that even when I know better, I still have a tendency to think small. When Cee asked to consider what gift we would like to receive (anything). Upon thinking about it for a couple of days, I thought it would be great to have a place to pursue my quilting art and creativity for a period of time in a retreat or studio experience. Here is the question and my actual response from that post. But then a couple days later, I was out walking, and that’s when it occurred to me that if I could choose any gift, I really should be thinking much larger. And I got caught on that post. Don’t get me wrong. I love quilting and art-making in general. I love making music. The idea of having a place where I could really pursue those activities is awesome. It’s the second part of the “gift” that I really missed. I mentioned that I would like a few other artists there with whom I could interact. Duh! Many people have memories of doing creative things as a child. But we often put those things aside as we “grow up.” No time. Or we got the idea that we weren’t necessarily good at it. Or as we got older, we might have been told that there was no way to make a living with that kind of thing. Whatever the reason, we may have pushed artistic expression underground. I have been fortunate to rediscover some of my childhood passions as well as discover several new ones. I sometimes don’t give enough time and attention to these artistic pursuits, but I recognize their importance. As a result, I want to make adjustments in my life that open up my participation in creative expression. My dream is to help people uncover or rediscover their artistic and creative dreams. I want to help people to want to dream big, whether it be starting a graphic design business, painting, designing clothing, woodworking, writing, illustrating, creating a unique restaurant, or something totally off the beaten track. 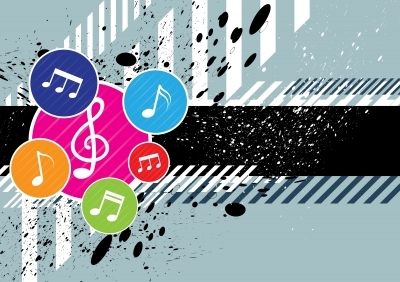 Even if it can’t be done all at once, we can take baby steps toward getting creative expression in our lives, baby steps that put us in motion toward the big pictures. When I first answered the gift question last week, I got so caught in the everyday aspects of life that I forgot to look at my big picture. By not having that in my line of vision, I asked for a gift that was nice, but was still limited–both in scope and in its influence. My new answer to the question? A residential retreat center with room for classes, studio space, and equipment to help myself and others find space to create and experience art in all its forms. And an assistant to help with all the administrative details, so that I can do creative coaching, teach classes, and explore artistic possibilities. How often I limit myself from accomplishing what I could be doing by thinking small. The Farther to Go! exercises and materials has given me the tools to change that. I just have to keep focused on the ideas I’ve gotten along the way. If I do, I will remember that the path to a life rich in creative expression is to think big and keep moving on those baby steps. When Life Gives You Lemons, Quilt! Did you misread that the first time? Did you think I said “Quit”? I have to admit, sometimes it seems easier to quit than to do something more constructive with those lemons. But today, when things started going south, I took a different approach. Somehow after the lemons stopped hitting, I had an idea about how to handle it. It was frustrating to see the day slipping away from me as I tried to process a series of things. I knew that I could not do a reasonable job on the writing projects I had. It was just too much. 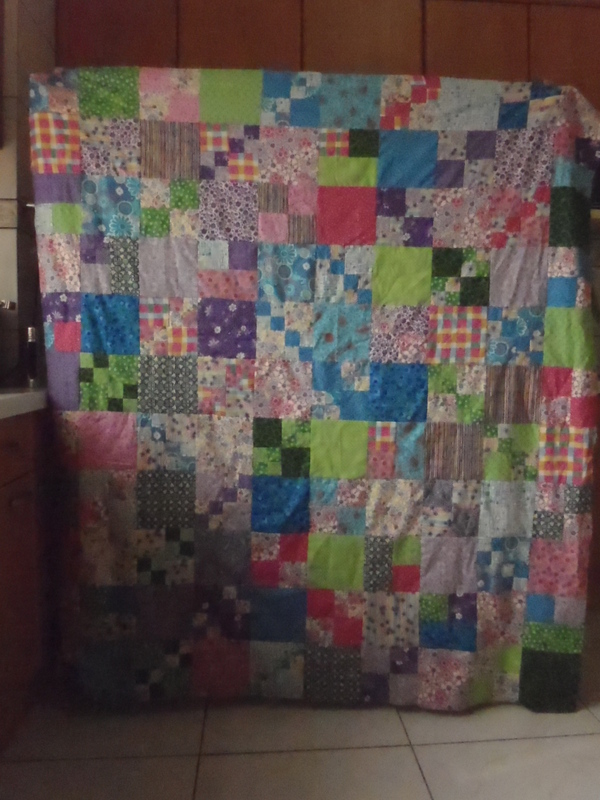 But I figured out that quilting — or more accurately, piecing — was just the thing to relax me and help me smile again. It also required less conscious brain power–which I am sadly in short supply of right now. It was the right thing to choose. The rhythm of the sewing machine is soothing. I have the pinning and sewing process set up so I easily move from one seam to the next to finish one block, and then move to the next set of pieces to sew the two seams that turn it into a finished block. Remember these fabrics from the Summer Mystery Quilt? Clues 1 and 2 have been completed, and it is time to complete the sewing for Clue 3. This sewing project has been on my mind since the clue arrived on August 1. So let’s just do it. And it also works for my Building Rome project this week. Normally, I wouldn’t do the “fun” parts of the list until after some of the other things are done, but I DID have enough brain power to figure out that if quilting got me back on track and helped get something done from my list, it was a total WIN. I also rescheduled an appointment I had for tomorrow. I can use that time to catch up on what I intended to do today. Which is a good thing, because I notice I’m starting to recover and feel like myself again. The quilting is working its magic. So I’m going to go back to it. I finished 4 quilt blocks, and I only have 12 to go. And I had an experience that proved this was the right thing to tackle tonight. I was sewing a seam and getting reading to put it in the finished pile. It was the fourth one. And I was surprised, because I had only remembered doing two. Yup, the PERFECT activity for tonight. Even if I don’t finish the 16 blocks tonight, I’ll have a great start, and I’ll be MUCH further along toward getting them done than if I had quit. 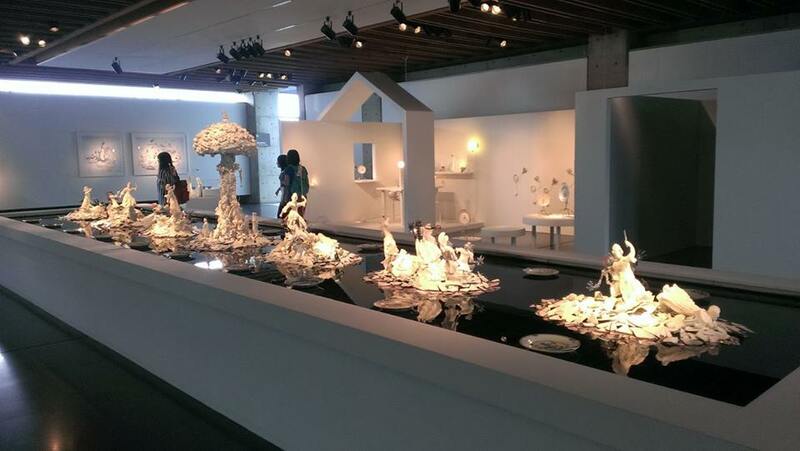 A photo from my last trip to the Yingge Ceramic Museum, just because. 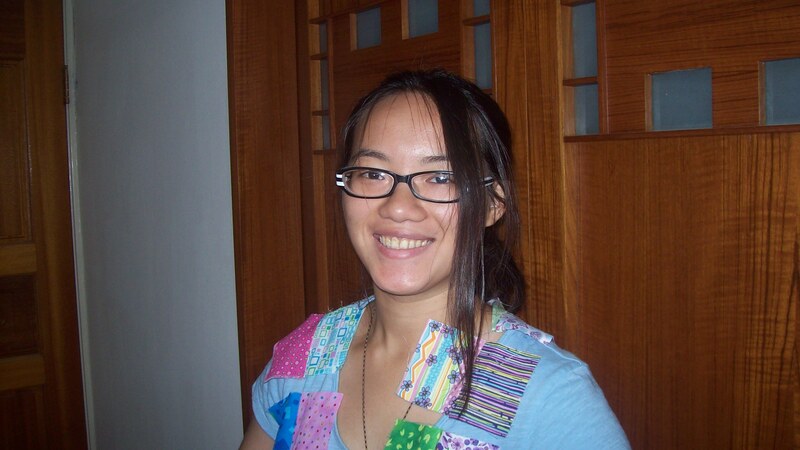 Since many of you seem to enjoy finding out “more about me,” I am joining in Cee’s weekly SHARE YOUR WORLD challenge. Here are this week’s questions along with my answers. I don’t use much of either. I use ketchup on the rare occasions that I have a hot dog. Ketchup and dill pickles. On occasion, I might have ketchup on a hamburger, but I’m more likely to use mayonnaise with lettuce and tomato. I like a little mustard on a ham sandwich and as a condiment in potato salad. At this point in time, my husband is the one who makes things when we go somewhere. But my favorite potluck story is from the mid-80s, when I rode a bus to my job at the University of Washington in Seattle. Potlucks were a bit of a challenge because I didn’t want to haul a lot of stuff with me, and keeping things hot or cold, depending on what they were could be an issue. So I came up with my bus-friendly go to dish that I took to every potluck we had while I worked there. It was easy, and it was a hit. It involved the grocery store and assembling it after I was at work. 1. From home I brought an unbreakable serving bowl, some plastic wrap, and a serving/mixing spoon. 2. I left about 15 minutes early for my walk to the bus stop, so I could stop at the grocery store (1 block from grocery store). 3. Pick up three ingredients at the grocery store: a bag of spanish peanuts, a bag of frozen peas, a container of sour cream. 4. Catch the bus to work as usual. 5. The peas thaw while keeping the sour cream cool. 6. About 10:30, combine all three ingredients in the bowl. Cover with plastic wrap. 7. When it’s time to set food up, remove plastic wrap, stir to mix one more time, and serve. Well, for those of you who have not witnessed the way I overthink things sometimes, you are in for a scare treat. For this week’s Cartoon Craziness Challenge, the theme is Happiness! It didn’t take me long to think: WOW! 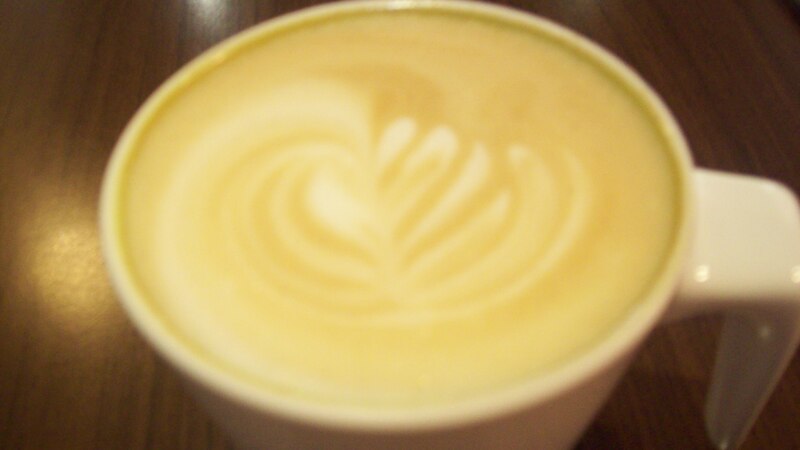 I can draw a cup of coffee. Not to difficult. Coffee makes me happy. It’s awesome. I can do this. Well, you get the idea. Then the next thing that came to mind is “Happiness is a Warm Puppy” — thanks Snoopy. And I love my little chihuahua, and since I’m no longer afraid of drawing things that aren’t perfect, I could work on drawing my puppy. Again — awesome! 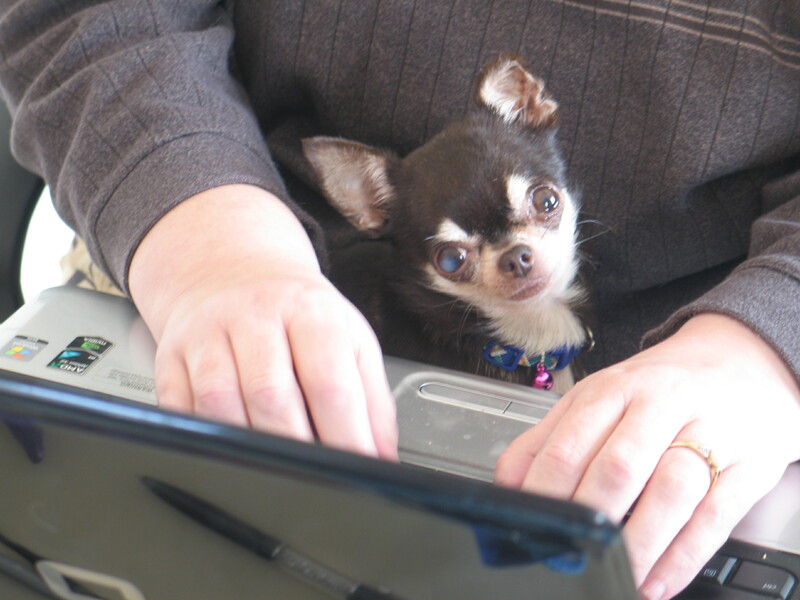 That led me to doing a series with a mug of coffee and a sweet chihuahua and . . . I was thinking of how to include quilting in some way. To give myself a little confidence when working on these challenges, I look online for how to draw tutorials for various things. 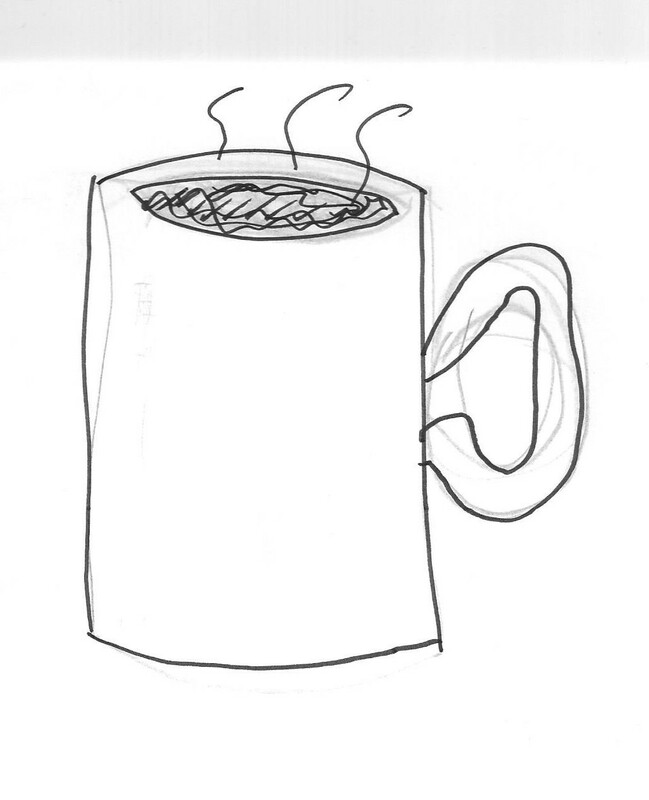 As a result, I have a prototype for my mug of coffee that you see here. Now I had three things to draw: coffee, puppy, kite. I mini-series. The coffee was in the bag, so to speak. I found a great tutorial for a chihuahua, and started a little practice one. I figured I could save the tutorial and do it in time for the challenge. I had a decent idea of how to do a kite — smart me: have something that makes me happy that’s super easy to draw. But I looked up a few tutorials anyway. 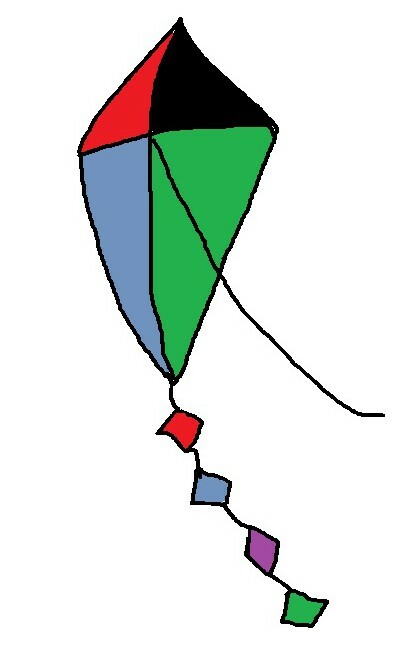 By a lucky slip of the fingers, I opened Microsoft Paint while I was browsing kite tutorials. Serendipity! So I thought, what they heck! I’ll play around with the Paint program and see what kind of kite I can come up with. Here’s the answer. 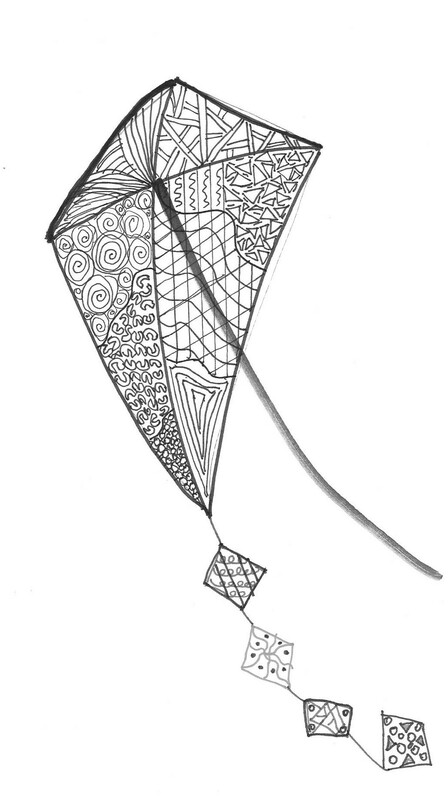 And here is my Zentangle kite! One of the most amazing things about the challenge this week is I realized doing these pictures is making me happy. This is an unanticipated outcome of joining this challenge. I expected it to challenge my attitudes and abilities in drawing. I didn’t expect it to become a source of excitement and happiness. Thanks to Mental Mama and Indecisive Eejit for hosting this challenge. And thanks to the people in addition to them who also kept egging me on. I’m so glad you did! MAJOR ANNOUNCEMENT: I JUST REALIZED THIS IS MY 250th POST! YAY! It was back on September 25, 2013 that I posted my first mention of 600 Days to 60. Here are a few excerpts from that post. Several months back, I discovered a blog, 400 Days to 40. Even though I found the blog rather late in her 400 days, it got me to thinking that I might like to try something similar for my next milestone. So I calculated (and recalculated) to find the magical day on which I would launch my new blog, 600 days to 60. I’ve decided that I’m not looking at this 600 days to 60 as a count-down, but rather a count-up! I want to think of these next 600 days as a journey to find the best version of me there is to find. It will be a process of excavation and checking the foundation, and finding new ways to create and decorate. It will be a time of new keywords and of intentions that challenge and revitalize me. A time of decluttering, revisioning, and finding clarity. My intention is that this journey allows me to find what is important and discard the rest as I move forward toward a life full of vibrant possibility. Well, parts of that have gone ok, but there is a long way to go. I want to refocus my attention on the original hopes I had for such a project. Over the next few days, I am going to review the posts that highlight the tracking I have done. And reconsider and restate the specific activities that I want to participate in during the remaining days until the celebration. The moment is now. 600 days to 60! It may not be as poetic, but the moment again is NOW! I still have lots of work to do, but I just had the urge to play a little bit (starting yesterday evening). Since it had been a long time since I felt that kind of urge, I figured the work could wait. As part of my summer mystery quilt project, I assembled some fabric strip sets. Yesterday, cutting them into segments was on the agenda, but I needed to replace the blade on my rotary cutter. The last time I cut fabric, it was kind of a slog. Having a new blade in my rotary cutter is like discovering a new land. I don’t know why on earth, I waited so long to change it. When I cut fabric yesterday, it was — dare I say it? — F U N ! I now have a slight insight into why I might have not been looking forward to that part of the quilting process. Now, it’s like: Bring me more fabric! I want to cut it! Because cutting fabric was fun, I actually thought about doing some sewing, but I didn’t do the sewing for the mystery quilt, I started sewing together scrap pieces leftover from when I pieced the top for my daughter’s quilt. So by the time I turned off the sewing machine last night, I had quite a string of these pieces paired up. When Dante got here today, she was amazed at how many of them were sewed together. Since I did chain piecing, they were all in one long strand. So she had the idea of stringing them up across the room. We decided (at first) that we should drape them around the closet doors. You can see the results of our efforts here. Here’s another photo of my newest quilting process model. By this time, we were really having fun! We talked of the possibility of setting a fashion trend. What do you think? Would it catch on? But seriously, here is a picture of them actually arranged on the ironing board. 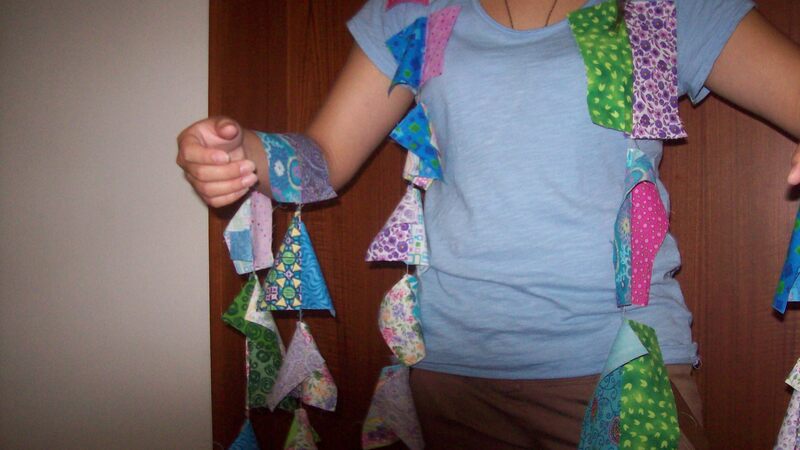 The next step will be to sew these sections together and continue playing with the colors and block sizes. With no definite plan in mind, anything is possible. 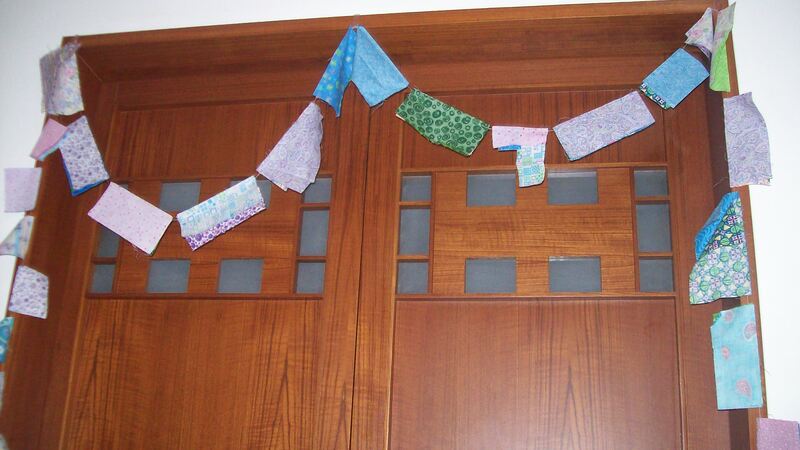 These lovely fabric scraps in various configurations may be appearing in another post in the near future. 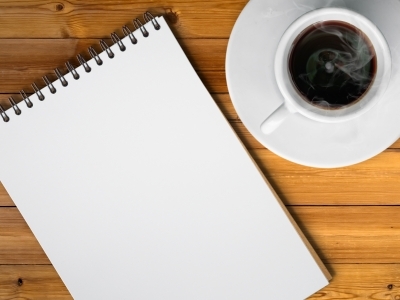 What have you been doing since we last had coffee? An added bonus: I took a picture of Dante that I was kind of surprised at because the lighting was really strange, but she really liked it, so we thought we’d share it with you. I hope you enjoyed our time together as much as I have. I can’t wait until our next time. Step 1 (given on June 1) was all about cutting different widths of strips from these four fabrics. From the fifth fabric, we were to cut thirty-one 6 1/2″ squares. These cuttings were then placed in a series of 4 zipper plastic bags according to the instructions. I’ve seen July’s clue for Step 2, which is to start sewing. And I have until August 1 to get it done. YAY! This is a challenge that I can handle. 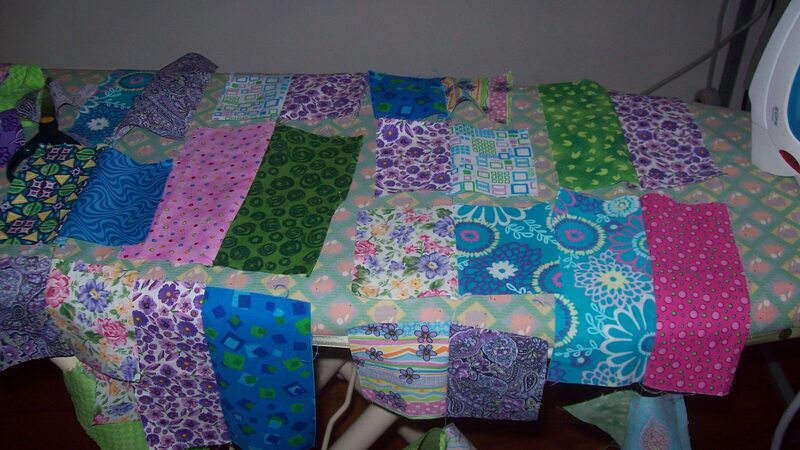 The fabric on the far right is the one from which I cut the thirty-one 6 1/2″ squares. That happened during the CLUE 1 cutting phase (the June clue). 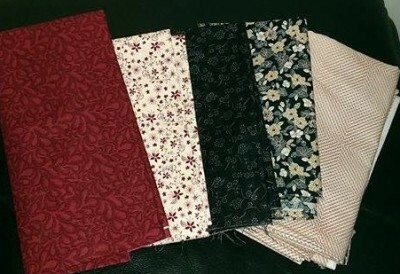 CLUE 2 (the July clue) involved taking 3 1/2″ strips of the fabrics 3rd and 4th from the left (the black an the black print) and sewing them together, cutting them into segments, and reassembling them into another kind of 6 1/2″ block. 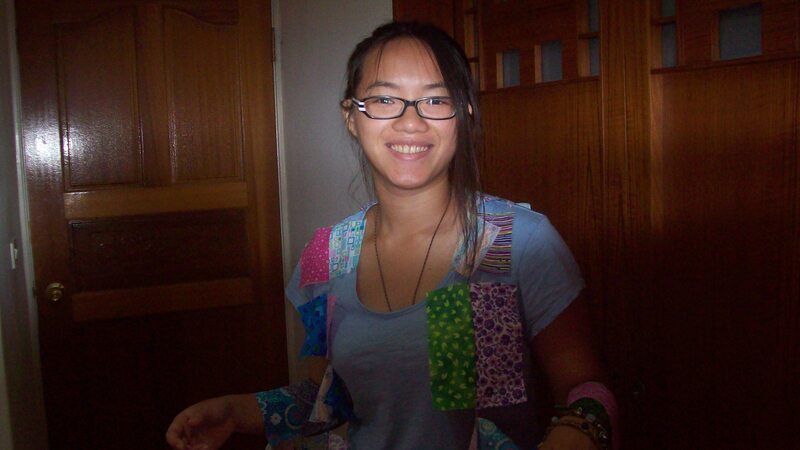 I had three 3 1/2″ wide strips of each of those two fabrics. By the time, they were sewn, cut and assembled, I had 18 4-patch blocks. My husband is experimenting with a camera that he inherited from a friend. That and he was using artificial light, so the colors aren’t quite lining up with what you see in the previous picture, but you get an idea of how the four-patch blocks look. 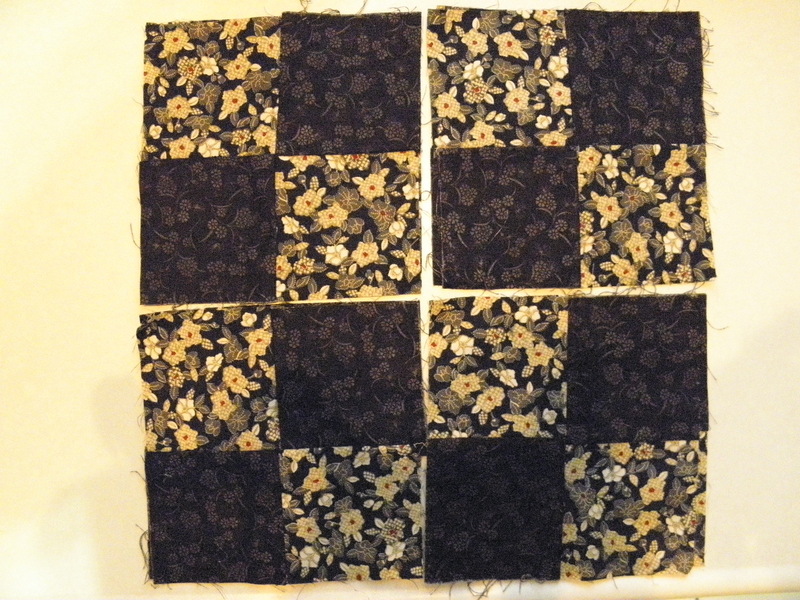 While you see four of them here, the quilt that I am making for the Summer Mystery Quilt needs 16 of these blocks. Which means I have two blocks left over that I can use for some kind of fun project with other scraps and leftovers from other projects. As long as I had enough fabric to make a couple extra blocks, why not? These blocks were completed last Sunday (July 20). I can’t wait for CLUE 3, which is coming Friday, August 1. I’m intrigued about what kind of block I’m going to be constructing next. Then, one more month to go for CLUE 4 (September 1), which will give directions about assembling the quilt top. I’ll be keeping you updated as it continues. 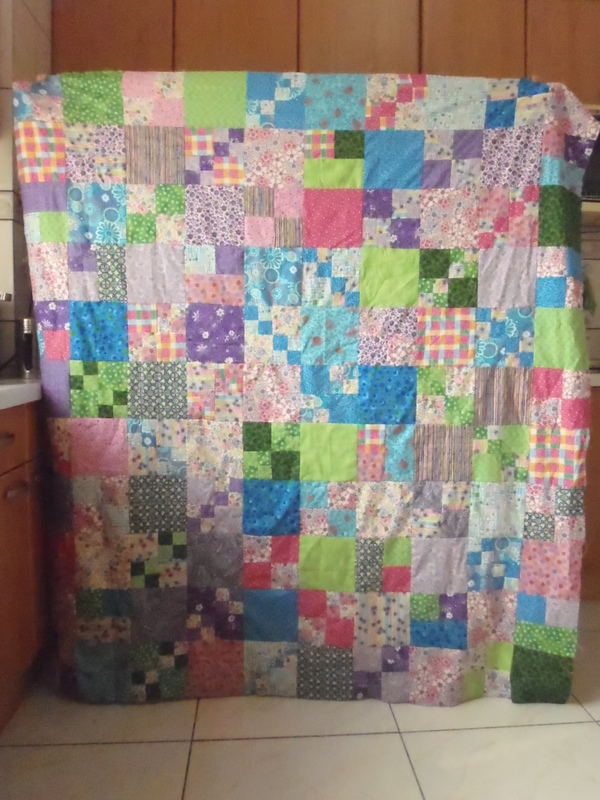 Thanks to Abigail Dolinger at Aby Quilts for providing this quilt-along challenge. The pace is not difficult, so if you are interested, you could manage to catch up with us.